Which Way Forward in Yemen and GCC-Iranian Relations? Video courtesy of the Baltimore Council on Foreign Affairs. Session on Geo-Political Dynamics: Syria, Lebanon, and Iraq with Dr. Paul Salem, Mr. Bassel Charles Korkor, Mr. Elias Samo, Mr. Charles C. Chidiac, Dr. Judith Yaphe, and Dr. Michael Hudson from the National Council on U.S.-Arab Relations’ 24th Annual Arab-US Policymakers’ Conference, “U.S.-Arab Relations at a Crossroads: What Paths Forward?,” on October 14, 2015, in Washington, DC. A Discussion with Gulf Cooperation Council Secretary General Dr. Abdul Latif Al Zayani. A summary of the key points and perspectives offered by GCC Secretary General Dr. Abdul Latif Bin Rashid Al Zayani at a September 18, 2015, National Council on U.S.-Arab Relations meeting. Envisioning the GCC’s Future: Prisms for Perspective – remarks by His Excellency Dr. Abdul Latif Bin Rashid Al Zayani, Secretary General of the Gulf Cooperation Council, to the Gulf Research Center’s Sixth Annual Gulf Research Meeting, University of Cambridge, Cambridge, United Kingdom. Introduction by Dr. John Duke Anthony, Founding President and CEO of the National Council on U.S.-Arab Relations. What do the Opponents of a Nuclear Deal with Iran Really Want? John Duke Anthony – What do the Opponents of a Nuclear Deal with Iran Really Want? The National Council on U.S.-Arab Relations’ 23rd Annual Arab U.S.-Policymakers Conference included a session on “Geo-Political Dynamics: Syria, Lebanon, Iraq, & Iran” that featured Dr. John Iskander, H.E. Ambassador Seyed Hossein Mousavian, Dr. Judith Yaphe, Dr. Najib Ghadbian, Dr. Imad Harb, and Dr. Trita Parsi. An audio and video recording of the session as well as a link to the transcript are available below. Videos of the entire 2014 conference are available on YouTube and podcasts of the conference are available through iTunes and FeedBurner. Dr. John Iskander – Chair, Near East and North Africa Area Studies, Foreign Service Institute, U.S. Department of State. Dr. Trita Parsi – Founder and President, National Iranian American Council; author A Single Roll of the Dice – Obama’s Diplomacy with Iran and Treacherous Alliance: The Secret Dealings of Iran, Israel and the United States. Dr. Judith Yaphe – Distinguished Research Fellow for the Middle East, Institute for National Strategic Studies; Adjunct Professor in the Elliott School, George Washington University; former senior analyst in the office of Near Eastern and South Asian Analysis, Directorate of Intelligence, CIA. Dr. Bassam Haddad – Director, Middle East Studies Program and Assistant Professor, Department of Public and International Affairs, George Mason University; Co-Founder/Editor, Jadaliyya Ezine; Visiting Professor, Georgetown University; author, Business Networks in Syria: The Political Economy of Authoritarian Resilience. Dr. David Lesch – Professor of Middle East History, Trinity University; author, The Fall of the House of Assad, The Arab – Israeli Conflict: A History, and The New Lion of Damascus: Bashar al-Asad and Modern Syria. Dr. Michael C. Hudson – Director, Middle East Institute and Professor of Political Science at National University of Singapore; former Director of the Center for Contemporary Arab Studies, Professor of International Relations, and Seif Ghobash Professor of Arab Studies, Georgetown University. Dr. Thomas Mattair – Executive Director, Middle East Policy Council; former Research Scholar, Emirates Center for Strategic Studies and Research; author,The Three Occupied UAE Islands: The Tunbs and Abu Musa and Global Security Watch — Iran: A Reference Handbook. Dr. Kenneth Katzman – Specialist in Middle East Affairs in the Foreign Affairs, Defense, and Trade Division, Congressional Research Service, Library of Congress. 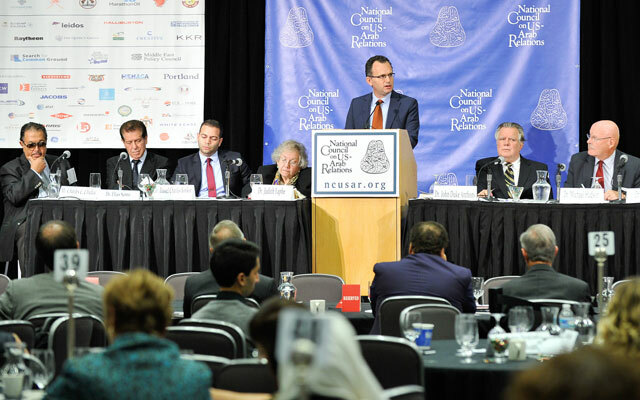 Mr. Alireza Nader – Senior Policy Analyst, RAND Corporation; author, Israel and Iran: A Dangerous Rivalry, The Next Supreme Leader: Succession in the Islamic Republic of Iran, and lead co-author, Coping with a Nuclearizing Iran. Ms. Hillary Mann Leverett – Senior Professorial Lecturer of U.S. foreign policy, American University’s School of International Service; Visiting Scholar, Peking University’s School of International Studies; CEO, STRATEGA; co-author, The Race for Iran Blog; co-author, Going to Tehran: Why the United States Needs to Come to Terms with the Islamic Republic (forthcoming).